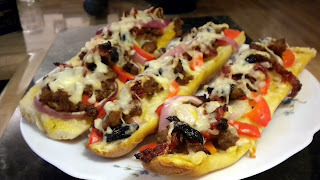 Zo's Sourdough Baguette Pizza is one of the best French Bread style pizzas I have ever had. I request this simple dish from her quite often when I am working on the house. It is easy to pick up and eat while you are working on a project but is also just a great snack food to eat out on the hammock! Enjoy! Brush the cut side of the sourdough with olive oil and then top with sun-dried tomatoes and garlic. Spread out your bell peppers, onion, olives, sausage, and cheese. Place Baguette Pizza onto a baking safe dish and bake for 15 minutes or until cheese is melted and sourdough is crisp and browning. Enjoy!